AGHS legal aid cell along with the Lahore High Court Bar Association and the Pakistan Bar Council hosted a memorial event to mark lawyer and activist Asma Jahangir’s first death anniversary on Monday. The participants resolved their commitment to carry Asma Jahangir’s vision forward for the rule of law, democracy and justice. Senior members of the legal community expressed their commitment to fight for democratic rights. Senior bar leaders stated that Jahangir struggled so that political parties could flourish, the provinces were able to exercise their rights, there was freedom of expression, farmers and labourers got their rights and so that Pakistan could have a robust civil society. Journalist and writer Ahmed Rashid felt that since last year, the situation of human rights had further deteriorated. The representative from the European delegation Javeria Kabani Rizvi stated that the European Union was proud to support the conference on Asma held in October 2018 as it provided a platform for values of democracy and freedom of expression. Human Rights Commission of Pakistan former chairman IA Rehman talked about the institutions set up by Asma for the promotion of rights of the most marginalised people in society and for bravely raising her voice against dictatorships and media censorship. Lahore High Court Judge Ali Baqir Najfi spoke about Asma’s devotion to the rule of law and her immense contributions to the legal community in Pakistan for both lawyers and judges. Finally her daughter, Sulema Jahangir spoke about Asma’s life saying the legal community was like her family and she felt the pain of her fellow colleagues and the sacrifices they made during the Lawyers Movement. She stated that her mother would have wanted lawyers to continue their struggle to uphold democracy. It was noted that today, Asma was the number one hashtag trending on Twitter from all of Pakistan and that she was an icon for young people who wished to see a progressive and modern Pakistan. 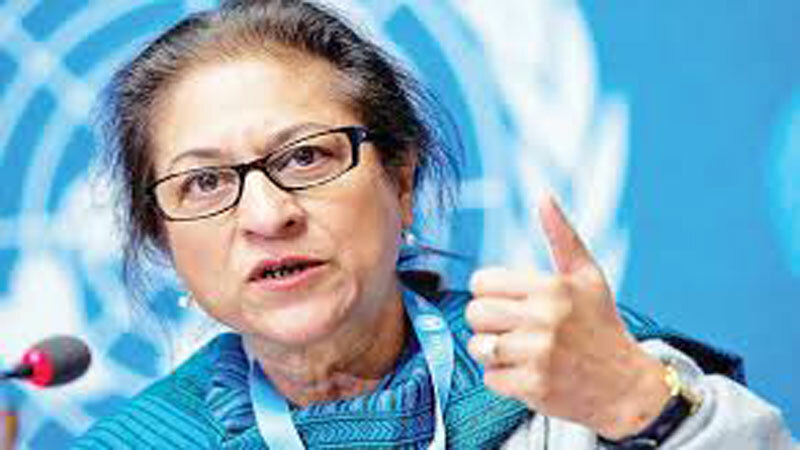 Asma’s daughter Munizae Jahangir who is now a noted journalist said that Asma had left a huge void in Pakistan and there were many who missed her voice for justice and freedom. She said that if her mother were alive, she would have spoken against the extra judicial killings, arbitrary detentions, enforced disappearances, political victimisation and media censorship and would have pursued these issues in court.